LASIK surgery is one of the newest techniques in the field of refractive surgery. LASIK has been available worldwide since 1990. Although this procedure has been widely available for 26 years, it has a proven history of success. What’s more, in the relatively short amount of time that LASIK has been performed, it has seen several advances that allow for even more personalized vision treatment. LASIK utilizes a powerful and precise excimer laser to alter the shape of the cornea and improve vision for patients suffering from nearsightedness, farsightedness, or astigmatism. Here, Dr. William Goldstein summarizes the history of LASIK, and explains how our Shelby Township, MI patients can benefit from the advances that have been made in refractive surgery. Vision impairment is nothing new, and since ancient times, doctors and scientists have been working to treat blurry vision. The first pair of eyeglasses can be traced back all the way to the 13th century. Glasses were the only vision correction option available to people until 1888, the year the first pair of contact lenses was crafted using hand-blown glass. While these lenses could address vision impairment, doctors were in search of a more permanent solution. The invention of the excimer laser in 1970 gave doctors hope that long-term vision correction treatment may finally be possible. One researcher in particular took great interest in the excimer laser. Stephen L. Trokel, a researcher from Columbia University, believed the excimer laser could be used to treat vision correction. Trokel used the excimer laser to begin experimenting on animal cadavers and human cadavers. He eventually tested his procedure on living animals. While Trokel was able to show that an excimer laser could safely alter the shape of the cornea, it wasn’t until 1988 that laser vision correction was performed on a patient. Trokel’s colleague, Marguerite McDonald, performed PRK (photorefractive keratectomy) surgery on a 60-year-old woman who volunteered to undergo the experimental treatment. The PRK technique involves removing the entire upper layer of the cornea and then reshaping the underlying tissues. In 1991, the excimer laser was approved for the use of PRK treatment in Canada. The laser gained approval in the United States in 1995. Although PRK could successfully improve vision, doctors still believed there could be a better technique available. In 1990, two European doctors began developing the technique that is now known as LASIK. This technique, which was commonly referred to as “flap and zap” involved the creation of a corneal flap. The doctors made an incision on the surface of the cornea, then lifted this tissue so that alterations could be made to the underlying tissues. The top flap was then closed, acting like a natural bandage. This technique resulted in less discomfort and a faster recovery time. In 1999, this procedure (which is now called LASIK) was approved for use in the United States. LASIK quickly proved to be a surgery that offered overwhelmingly positive results after just a brief recovery period. Still, researchers continued to work on advances that would enhance the procedure even further. In 1999, wavefront analysis was invented. This technology allowed doctors to create a detailed map of each patient’s cornea. With this technology laser eye surgeons could provide the most precise and personalized vision treatment. In 2002, wavefront technology was approved for use in the United States. That same year saw the introduction of bladeless LASIK. 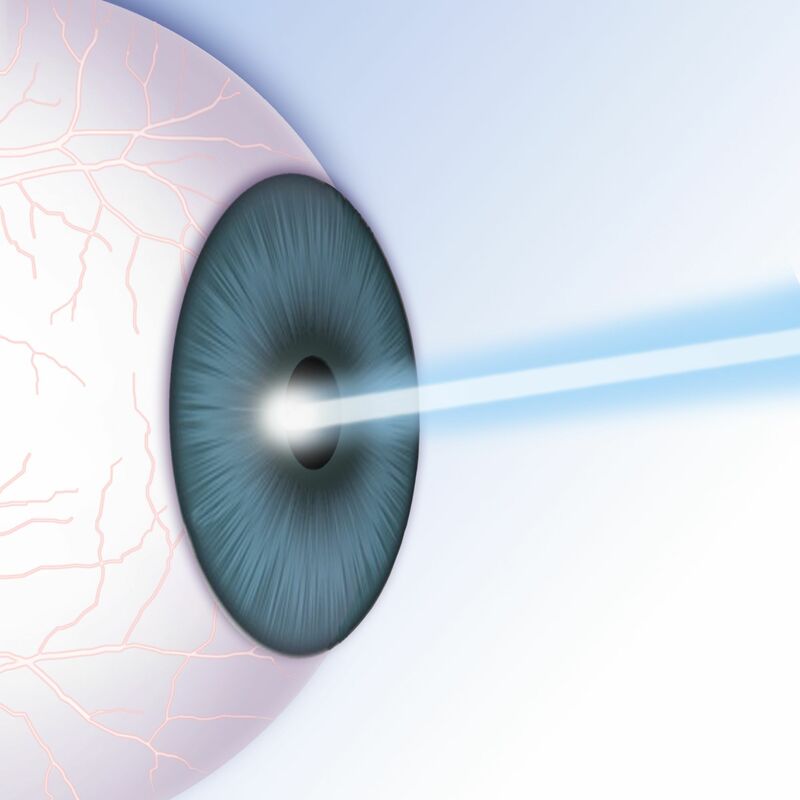 This procedure uses a laser, rather than a blade, to create the corneal flap. Dr. Goldstein utilizes both wavefront technology and the bladeless technique to offer his patients the safest and most effective form of laser vision correction treatment that is available today. If you are tired on relying on glasses and contact lenses for clear vision, it is time to consider LASIK surgery. Thanks to the continued advances in LASIK techniques, this treatment is safer and more effective than ever. Contact us at your earliest convenience to learn more about this revolutionary treatment.